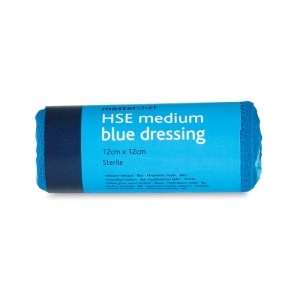 Ideal for almost all first aid situations, the Masterchef Blue HSE Dressings are good-quality, sterile dressings complete with conforming stretch bandages for comfortable fitting. With a bright blue design, the Masterchef HSE Dressings are immediately visible should food become contaminated, making them ideal for any restaurant, food vendor, or manufacturer. Each Masterchef Dressing includes an attached non-adherent pad to place over the trauma area, and a long conforming bandage to easily secure the dressing in place. The bandage can either be tied at the ends, or secured in place using tape or safety pins. The dressings are available in one of two sizes, Medium (12 x 12cm) or Large (18 x 18cm), depending on your needs. Each dressing comes wrapped separately to ensure sterility, with an expiration date printed on the label so that you can easily check that your first aid kit remains up to date. 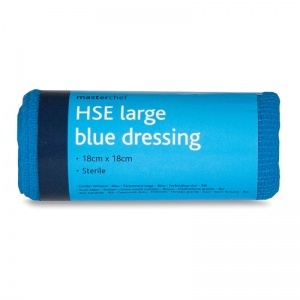 The dressings are blue in order to meet the regulations stipulated by the Food Safety Act of 1990, and can be used in all catering or food preparation areas. Buy a minimum of 10 dressings to keep as spare HSE refills for when stocks in your first aid kit run low. The Masterchef Blue HSE Dressings are usually dispatched via First Class Royal Mail and delivery should be within 1 to 3 working days.